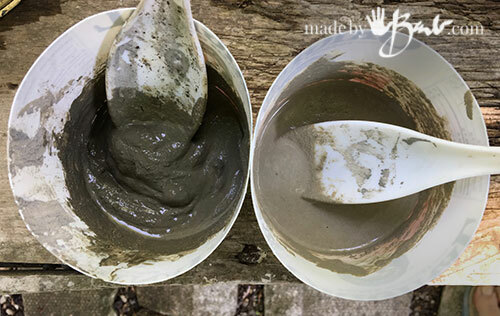 Compare Concrete Mixes for Crafting - Made By Barb - which concrete to use? I remember many years ago when I started buying concrete, I’d stand there reading and checking the packages, looking quite puzzled, and then someone would think I was sent by my husband to buy ‘normal’ concrete. After a few attempts of trying to explain what I wanted to do I would just buy what I felt was right since they usually thought I was a bit crazy… Even nowadays there are so many that it’s quite daunting. I knew what I did not want; large aggregate in my mix, which is what the regular Concrete mixes have. They are quite cheap and can work for large pours in large molds or sidewalks. I am usually making small things that were going to be cast in molds or hand shaped for decorative home use. 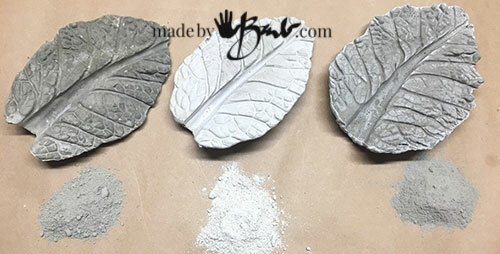 ‘Leaf-casting’ was perfect to make my Concrete crafting tests since I like to work quite thin. These leaves are my new favourite; Savoy Cabbage! Since time is always short around my place so I like to see my projects finish quickly and I am constantly improving or redesigning so I can’t wait weeks or even days! I really do love the ‘fast set’ mixes but am not exactly sure about what makes them so quick and also so much stronger. There are special additives in the concrete mix resulting in a dense less porous finish. With that comes quite a hike in price, but it’s worth it in my eyes! The above Rapidset Cementall is probably my all-time favourite! The specs say that it can be used at different consistencies and it will cure much harder than regular concrete. I am sure there are additives like polymers for strength and those also make it quite moldable at a thicker consistency. I learn by testing and it has worked well for many of my projects. Usually readers who have had concrete problems it’s because of the choice of concrete. Rapidset Cementall Concrete Mix will start to thicken in about 30 seconds and can usually be taken out of the mold after 1 hour. The molds that I make are quite stiff and this mix will withstand the vigor needed to sometimes take them out. This mix is super fine, will pick up all the details and provide a super smooth white finish. It will be even be shiny when the mold is also shiny material. 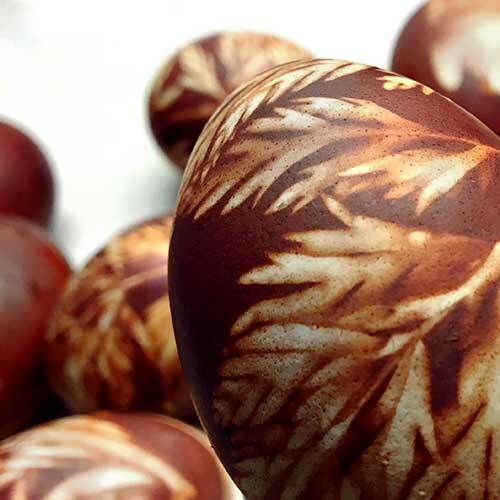 At a thin consistency it will be easily poured such as the Coasters and the Monster Eggs. The strength achieved in a thin wall is quite amazing! When reading the specs for different mixes it will give you a clue at how it can/should be used. ‘Featheredge’ means that it can be used at a very thin layer. Some mixes will state not to be used above a certain thickness. The Rapidset Cementall can also be used at a thick; sculptable consistency. It will still slump ( a high pile of mix will flatten and sag) but not usually run away. That makes it work well for leaf casting such as the Lacy Circle the Smiling Stones. The workflow can be quite fast since sections harden quickly allowing more material to be added such as around an Orb or a Face sculpture. Dampening the drier sections is good practice before adhering new mix. Different brands offer similar products. Since entering the Quikrete contest I wanted to use a Quikrete product that compared to the RapidSet Cementall. I find this mix is almost exactly like it. 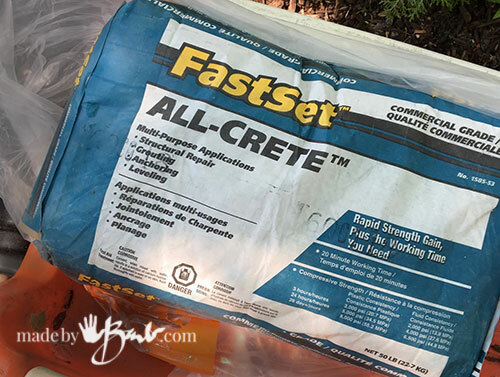 It does seem like it comes under a few different names; Dual Purpose Grout & Structural Repair, Fastset Repair Mortar and Quikrete Fastset All-Crete. (See a selector guide here) It may be a difference of countries (here in Canada) Do NOT confuse it with any regular Fastset Mix though, as it will have large aggregate in it. If it says that it is meant to make sidewalks and post foundations that is usually the indication. It has much of the same qualities, workability and also stated it can be used at all kinds of consistencies. It also a fine powder but the colour is more like a true concrete ‘grey’. A new huge 20″ Orb will be posted soon and it used this mix. It performed well at less than 1/2″ thick and quick-setting allowed great workflow. If you can wait a bit longer but still want strength then the Vinyl Patch products will also work well. Quikrete Vinyl Concrete Patcher also has additives to make it really strong but does not set as fast. It has a window of 30 minutes of work time (conditions can affect it) and will be hard in 24 hours. It has good bonding abilities so layering works great as in Giant Orb making. You can see it still is a fine mix but I’d say it feels a bit more sandy. It cures to a similar concrete colour to the Fastset. You can see a slight bit more texture in the final product. This is another of the bonding mixes with great strength and it performs very much like the Quikrete Vinyl Patch. 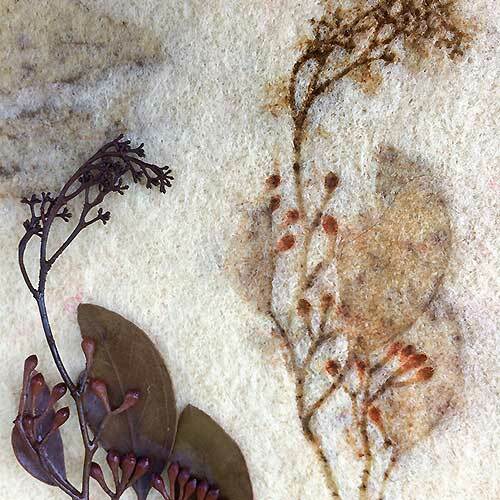 Sakrete Top’n Bond will work for the continuous building around an orb or casting of thin leaves. It will set in a day as well. My 20″ Giant Orbs have lasted well through the canadian winters and are light enough to carry with one hand. Amazingly only 1/4″ thick. Stomping on it would likely break it but they are really ornamental garden sculpture. So, there you have 3 direct comparisons (left to right) Quikrete Fastset Allcrete, Rapidset Cementall, and Quikrete Vinyl Concrete Patcher. 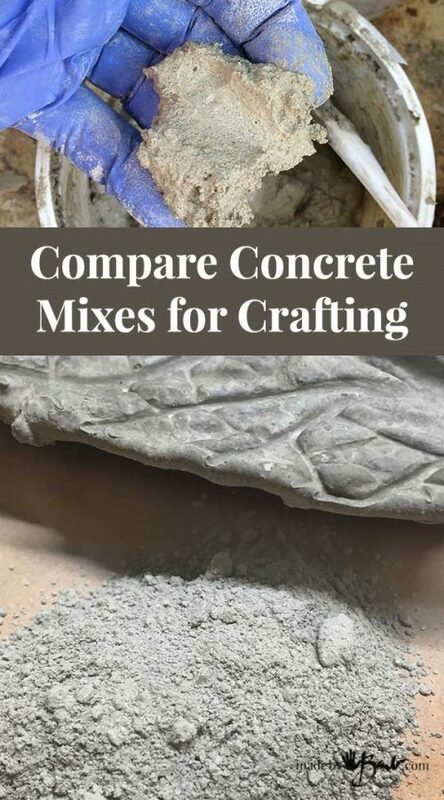 This is by no way the only available mixes but it does give me quite the selection to get my concrete crafts done. 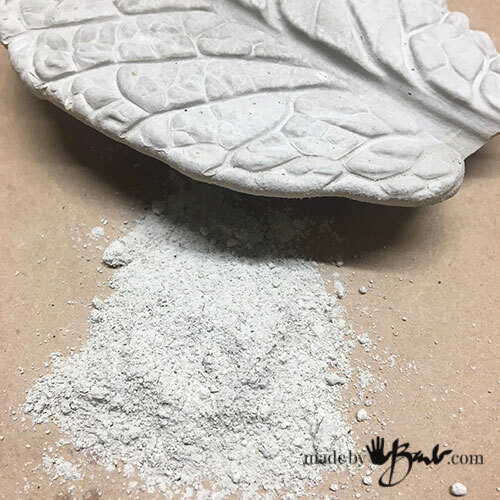 If you are still a bit apprehensive about working with concrete visit my tips post as it does not mean that you need to be ‘covered in concrete’ to make some easy treasures! 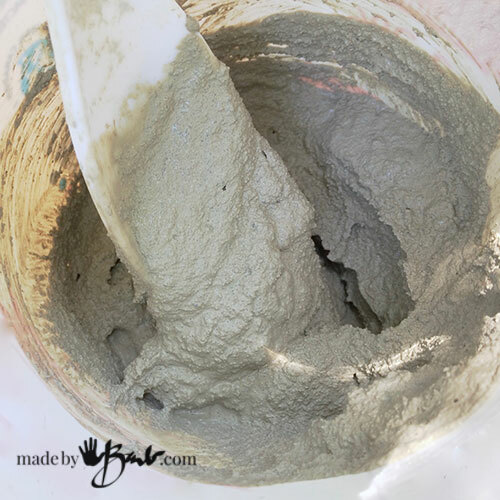 Crafting with concrete is like making a cake mix that does not need baking… And you can keep it forever! Thank you Barb, your information is always most useful and greatly appreciated. I’m glad it’s appreciated! I know I could have used that kind of info way back when… Gee, what did we ever do before the internet?! 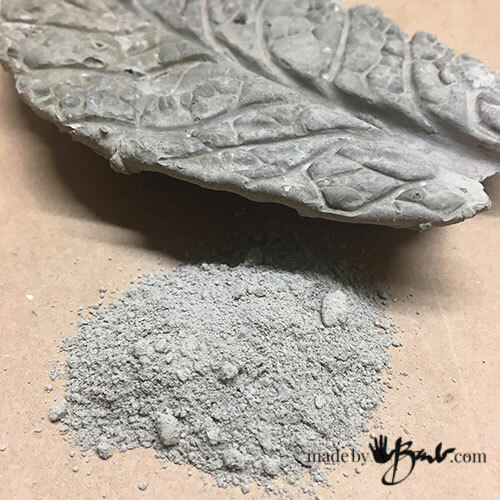 Hi I am in the process of making a mold for melting lead into for fishing weights I have used the fire cement they use in setting fireplaces it works but not the best as it breaks up after a couple of uses. Do you know of or can recomned some mix or make of cement that would be suitable for me to use. Can you please help? 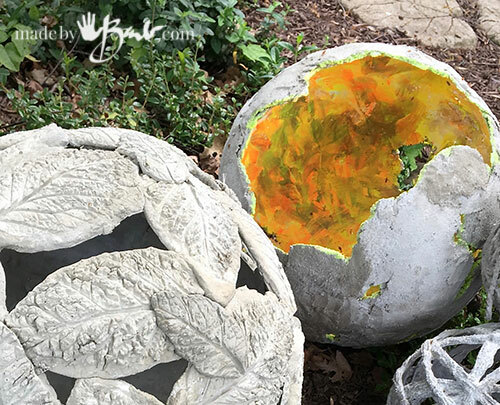 I tried to make a concrete pot this weekend but when i took it out it crumbled in my hands. What is the sand to cement ratio? I cant get the ratio right. Please help. I am from Rep of South Africa. We dont have the same products as you. It would help me if I knew what ratio your used. It may also be that it cured too fast. Keeping it damp will help strengthen the concrete as it cures as well. The ratio for mortar is 1 part portland cement to 3 parts sand. Slight more cement will make it stronger as will some acrylic additive. If you add some fibres that will strengthen as well. My bowls are made with a sand topping mix. 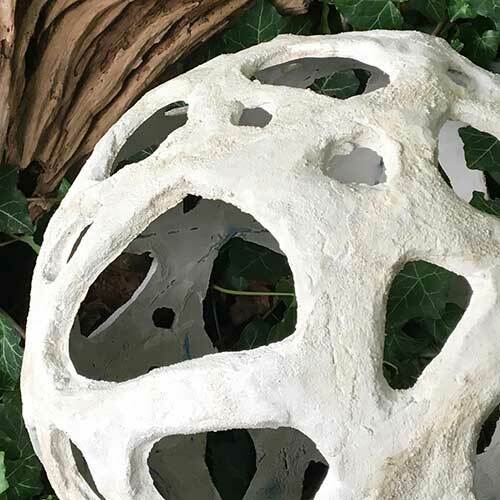 I want to attempt my first try to make something out of concrete. I have had this idea for a long time now and have been searching for information and the what and how’s for a long time now. I want to make Hands but the arm should be a little longer than what we usually see in pictures. I want to make a few as i want to set them up in my garden in a specific corner. So these hands must stand with the hand pointing upwards. Do you think those long, thick, garden gloves will work for such a project. Also, will it not be a problem to cut the rubber loose from the concrete after it has set? Haha, I have tried the rubber-gloves-concrete-hands. It did not go so well. You need to consider that the rubber needs to be pulled out from between the fingers so any really close fingers is a problem. IF I did it again I’d use really strong mix like the RapidSet Cementall as I had the fingers break when I used hypertufa. (I hate waiting eons for it to set) So that may have been the problem. I really appreciate this post! I have been afraid to try the rapid type concretes and have had to be so patient waiting for my projects to set! 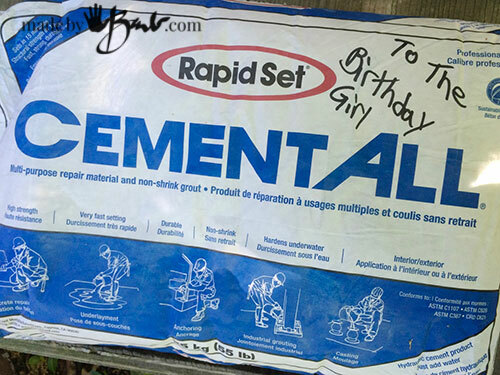 It was driving me silly, so now I can’t wait to try the rapidset cementall! 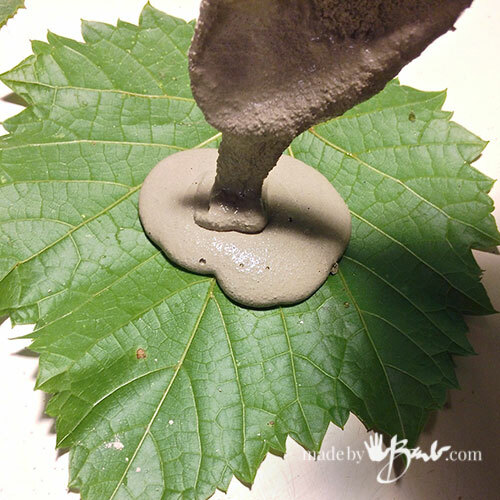 I have been making concrete leaves this summer to make a rhubarb leaf water fountain. As a fellow Canuk, i’m wondering what you use to seal concrete, especially if you “paint” it or dry brush some color? Do you find sealing is enough to help it last through winter, or do you store your cement creations indoors through winter? (I’ve been using Portland cement with sand in a 1:3 ratio for most of my concrete). I’m grateful and thankful for any advice you can provide. 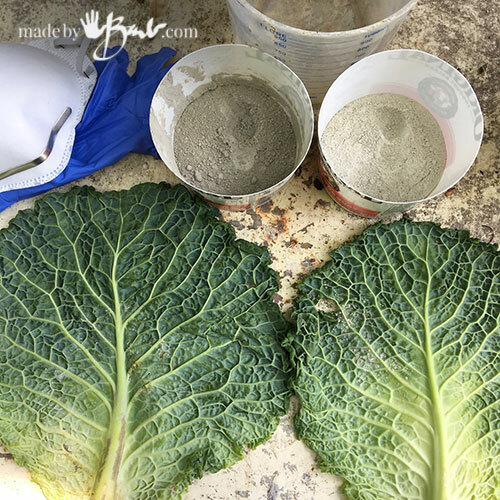 Sorry it’s not a quick answer… I have noticed though that Cementall is so dense that when I made some sealers to test they did not perform any different than the ‘naked’ concrete, ie- it did not leach any water through. I’d almost be inclined to see how it would last just as is without any coating. The water would be running over the leaves? or sitting? I have made the stepping stones with a sand-topping mix which would be much like your mix. They have held up as well as any sidewalks. The ‘cream’ will eventually wear off and will show more of the sand or aggregate. Last thing I want is to be a slave to my concrete… that’s why I make concrete. If it does not last I’ll make some more. It outlasts my attachment in most cases. That is a tough question. Sometimes people refer to Portland Cement as concrete. When you say ‘builders concrete’ is it a mix? or the portland cement? If it’s the cheap mix with the stone/aggregate I have heard that some people just sift out the big rocks and use it as a sand mix. If it’s portland cement use a ratio of 1 part portland cement to 2-3 parts sand. Do keep the curing planters out of the sun and dampen during curing. Hi Barb, thank you so much for sharing this very useful information, I truly appreciate it! I’m interested in making jewelry (pendants, bracelets, rings, etc.) is there a mix that you’d recommend for that? 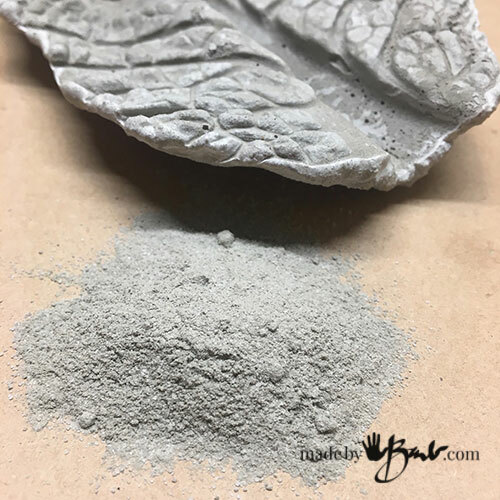 How do you feel about pure portland cement? I got it as it was 10 bucks for 90 pounds. It works but just wondering what you may jave experienced. I have a paper shredder, and if you mix a small amount of that in your cement mix — holds great, makes it lighter to carry. I just love your site. What kind of white concrete would I use to dip stuffed animals into? Frankly the Rapidset Cementall sets so fast that I manage to keep working and adding as I have for the Gigantic Leaf orb. 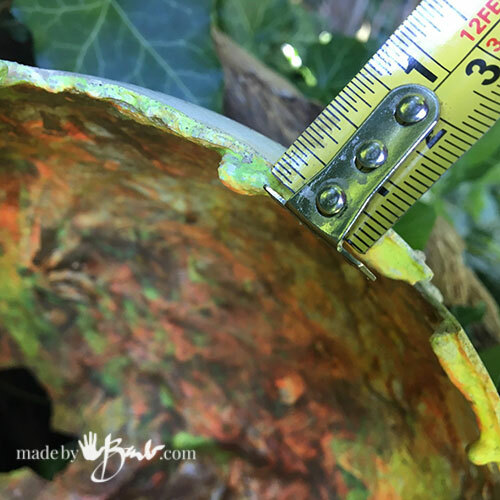 It will depend on how/if you need to maneuver the sculpture as you work on it. Sometimes it even sets too fast, before I can use what I have mixed. If you are subscribed you can reply to an email post. I just love your artwork. Thank you for sharing with us. I have a question about sand. I’ve tried using an all purpose sand, but it was too rough and gritty. The hardware store suggested paver sand, which I purchased today. After opening the bag I found it to be kinda chunky too. I tried finding the Quikrete sand/topping mix locally, but had no luck. Do you have any other sand suggestions? Can I use play sand? Hi iam from NZ i am wandering what tuoe of cement i would use to do a few simple DIY garden pots . This will be my first attempt. Hi Barb, thanks for your helpful information!!! I am planning to DIY concrete planters. 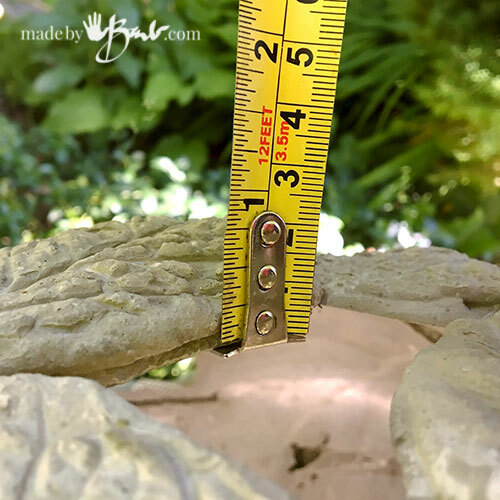 Since I am going to paint some cute patterns on it, I am looking for a concrete mix that will have a smooth surface and not pricey (I am a student, and don’t have lots of budgets). which concrete mix will you recommend? Thanks so much! Thanks so much for your suggestion!! I’m making an indirect mosaic for the first time and the depth of the finished project will be an inch deep and a foot long square. What kind of concrete mix would you recommend? I don’t want to be rushed as this is my first time, so maybe rapidset wouldn’t be the best idea. 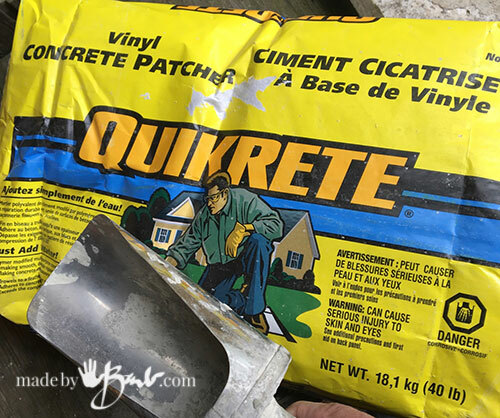 Would the quikrete vinyl patcher work–if so what was the proportion of cement to water that you used? I had a follow up question, too. I was thinking about using the quickrete sand/topping mix to cast a one inch thick indirect mosaic (it is a foot long and foot wide). 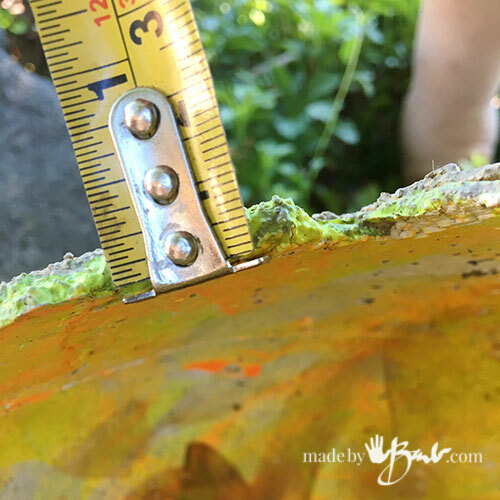 I recall that you made stepping stones with the sand/topping mix–one question I have is that for applications between 1-2 inches where the sand-topping mix is being bonded to another substance (in my case the mosaic tiles), Quikcrete recommends using a bonding adhesive. Would this be necessary for my project? 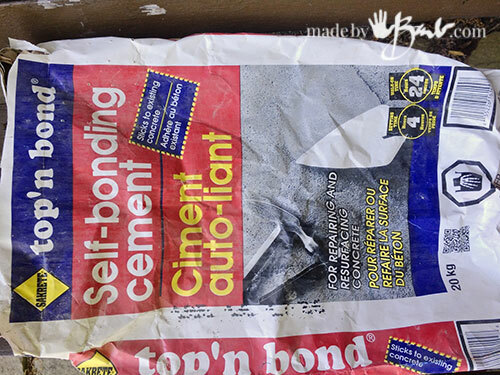 My gut tells me no–I think the bonding adhesive is only suggested for concrete to concrete, not for rough mosaic tiles, but I thought I’d ask. That’s a tough one. Many moons ago I had made mosaics on premade concrete patio stones using the proper tile adhesive and then a sanded grout (figured if it worked in the shower it would work outside) however the tiles/grout lifted in the canadian winters. It’s probably going to be horizontal so more chance of taking in any moisture. I’m afraid water may get between the tiles and concrete and then freeze/lift. I know the rapidset is super quick but maybe working small sections could work. It is so dense that I don’t see any water penetrate as other concrete. If the tiles are porous you don’t want them stealing the moisture from the concrete either so they should be damp/wet. Bottles of the bonding agent are pretty cheap so I’d suggest considering the amount of work you’d be doing. Another option is once finished you give it a super good waterproofing/sealer and be diligent with freezing and water conditions. That’s the best advice I can give considering I’ve not done it. I have combined stone with the rapidset with bonding agent.